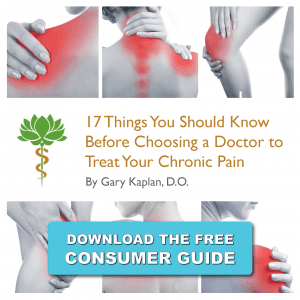 Are You Looking For Relief From Your Fibromyalgia Pain? If you or a loved one is suffering from fibromyalgia, you know what a frustratingly complex and debilitating disease it can be. You may already have seen several physicians and specialists, each time to be disappointed that you’re still in pain. Fibromyalgia is a disorder that causes muscle pain and fatigue. People with fibromyalgia have chronic and widespread pain, as well as “tender points” on the neck, shoulders, back, hips, arms and legs, which hurt when slight pressure is applied. Women with fibromyalgia may also have painful menstrual periods. Often fibromyalgia is associated with depression. The causes of fibromyalgia are unknown, but it appears that problems with the nervous system are involved. It is estimated that fibromyalgia affects as many as 1 in 50 Americans. Most people with fibromyalgia are women, and most are diagnosed during middle age; however, men and children can also suffer with the disorder. To obtain relief from the pain and the fatigue associated with the disease, you need to find a legitimate expert in its diagnosis and treatment. One of the difficulties in diagnosing and treating fibromyalgia is that it shares symptoms with many other illnesses. In addition to biotoxicity disorders, patients suffering with serious hormone imbalances, autoimmune disorders, insomnia, musculoskeletal injuries, Post Traumatic Stress Disorder (PTSD), and nutritional deficiencies also can experience the generalized pain and fatigue associated with FM. Furthermore, although fibromyalgia is a disorder of the central nervous system, it often coexists with pain that is muscular in origin, and that component of your pain can be cured, or greatly alleviated, with appropriate treatment. The bottom line is that your doctor must be able to distinguish fibromyalgia from any co-existing problems that could be creating symptoms, which, though similar to those of FM, require their own, targeted treatment. Please call (703) 532-4892 to schedule an appointment, or for more information, please click here.